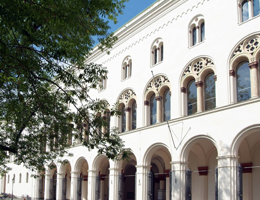 In the Times Higher Education (THE) World Reputation Ranking 2016 LMU Munich is listed in 40th place. LMU thus maintains its standing as the most renowned of the German universities and is rated among the top 10 in Europe as a whole. The top three institutions in the THE World Reputation Ranking are Harvard University, the Massachusetts Institute of Technology (MIT) and Stanford University. LMU, ranked 40th in the list, retains its position as leader of the German contenders – as the only one to make the Top 50. The Times Higher Education World Reputation Ranking 2016 is based on an opinion survey carried out in the first quarter of 2016 to which leading academics worldwide were invited to contribute. In all, 10,323 scholars and scientists in 133 countries responded to the questionnaire. Each participant in the survey was asked to name those institutions which she personally regarded as the best, in terms of the quality of both teaching and research, in her own particular discipline. The data employed in the compilation of the Reputation Ranking thus represent the subjective views of the global academic community, and provide only one of the 12 indicators which form the basis for the World University Ranking 2016, which will be published in the autumn.